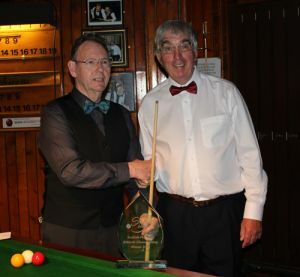 Results from a great day of Billiards at The Locarno, Edinburgh. Davie Sneddon (74)  1-0  Louis Knowles. Davie Sneddon  1-0  Hugh Elden. Louis Knowles  [1-0] Dougie Melrose. Davie Sneddon (66)  1-0  Alan Shephard. Jim Burke  0-1  Dougie Melrose. Alan Shephard  1-0  Jim Burke. Davie Sneddon (111)  1-0  Dougie Melrose. Alan Shephard  0-1  Dougie Melrose. Jim Burke  0-1  (62,50) Davie Sneddon. Gordon Adamson  1-0  Louis Knowles. George Plant  0-1  Hugh Elden. Louis Knowles  1-0  George Plant. Gordon Adamson  0-1  Hugh Elden. Louis Knowles  1-0  Hugh Elden. Gordon Adamson  1-0  George Plant. Gordon ( total points 462 ), Hugh (516) and Louis (559) were tied, all winning two matches each. Louis and Hugh went through to Semi Final on highest points difference.